In many respects, I am the epitome of Modern Woman. I was the first member of my family to go to university. I have a well-paid professional job. I once impressed the hell out of my mother by mending my own toilet (I had to buy bits from B&Q and everything). I own my own home, and I park my own car on the drive. Ah, yes… parking. To tell you the truth, I never was terribly good at it. It’s only recently that I’ve mastered the art of reversing into a space, and as for parallel parking, forget it. I like to blame my lack of height for restricting my view out of the car, but really it’s just incompetence. I proved this point a couple of days ago when, arriving at work, I aimed at my usual parking space, missed, and slammed the offside front tyre into the corner of a kerb. It occurred to me fleetingly that I might have damaged the tyre, but I’ve always got away with crashing into kerbs before, so assumed that this time would be no different and wandered off to work. Ten hours later, when I returned to the car, the tyre was, of course, as flat as a pancake that’s been unexpectedly lying on the wicket at Lord’s when the heavy roller was being applied. Ardent feminists may wish to look away now for, despite all that Modern Woman guff at the beginning, I have Absolutely No Idea How To Change A Tyre. After the initial internal dialogue in which I persuaded myself that no, it was not going to be ok to drive the ten miles home even if I took it really slowly, my first thought was to send a panicky, uninformative text message to Mr SB. Quite how he was supposed to react to “I’VE GOT A FLAT TYRE” from fifteen miles away without even knowing where I was, I’m not sure, but I sent it anyway. My next instinct, to my shame and the despair of bra-burners everywhere, was to Find A Man. A quick tour of my department revealed that all the men had gone into hiding, possibly alerted by the strange swirling draught from my fluttering eyelashes as I walked up the stairs. Fortunately, my department also contains at least two women who are less feeble than I when it comes to cars, and one of them agreed to give it a go. With the help of a passing clergyman and a spectacularly kind taxi driver, we (I use ‘we’ here even though my sole contribution was to flick through the car’s manual while offering no actual help whatsoever) managed to change the wheel and I finally set off home, feeling like a Complete Girl. As a postscript, just to destroy the last remaining shreds of my feminist credentials, I then sent Mr SB to get the tyre replaced. 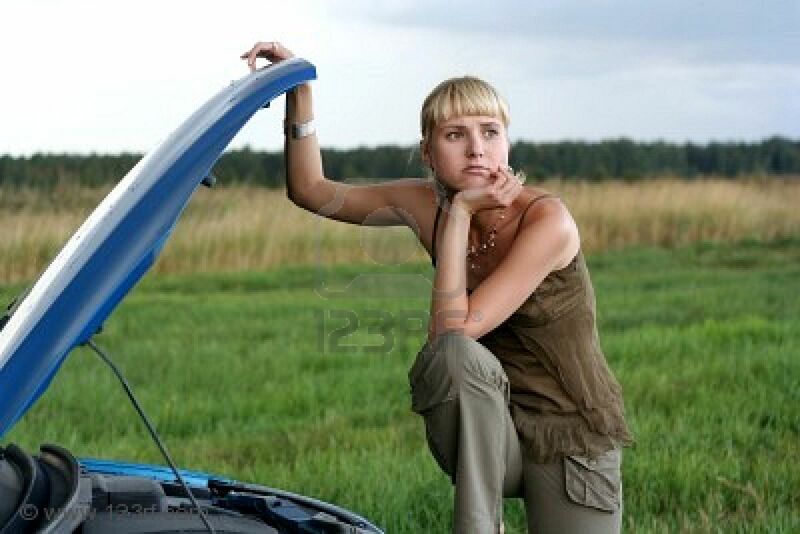 He informed me that the mechanic’s reaction had been, “Hmph. Typical woman.” And, in this case, I have to confess that he was right. ~ by somethingblonde on February 13, 2011. I don’t drive, but years ago I went on a vehicle maintenance course; if anything bad happens to any pre-1972 Vauxhall Viva, I’m your man! Thanks, I’ll bear that in mind. Maybe I should trade in my Toyota for a pre-1972 Viva, just in case. I can change a tyre! However, I have a manicure to consider so never would. My mother is legend in my family for having a crack at it with her manicure kit. I seem to recall she did manage to get the hubcap off but didn’t have the right wheel nut attachment.